God has a purpose for each family. You have the awesome responsibility of introducing your kids to how God uses families in the Bible and in today's world. Two- and three-year-olds are just becoming aware of relationships within their own families. 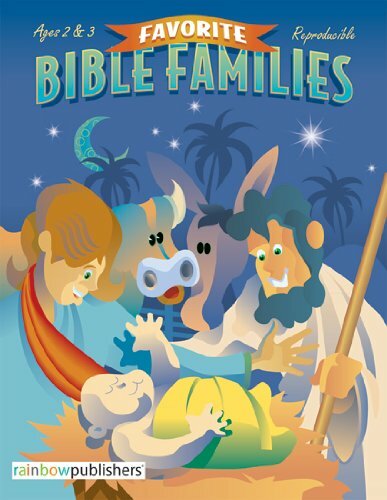 The lessons and activities in FAVORITE BIBLE FAMILIES, AGES 2-5 are designed specifically for the interests and abilities of this young age. From troubled twins to faithful fathers, the Bible is full of families. Adam and Eve created the first family. Then Noah saved saved his family by building an ark. Mighty Moses led his family - and many others - across the Red Sea. And who could forget the wonderful story of Jesus' family? God has a plan for every family. With Favorite Bible families, you can use examples of families in God's Word to teach your students about His design for their families every day. Each Bible family in this book is a lesson unit, with several themes that apply to that family. Discussion suggestions, memory verse, step-by-step instructions, and more are included with each lesson to help you make the most of your teaching time. If you have any questions about this product by Rose Publishing, contact us by completing and submitting the form below. If you are looking for a specif part number, please include it with your message.